With the chilly weather here and boy is it cold, I have been craving a good, comforting soup to warm my bones. 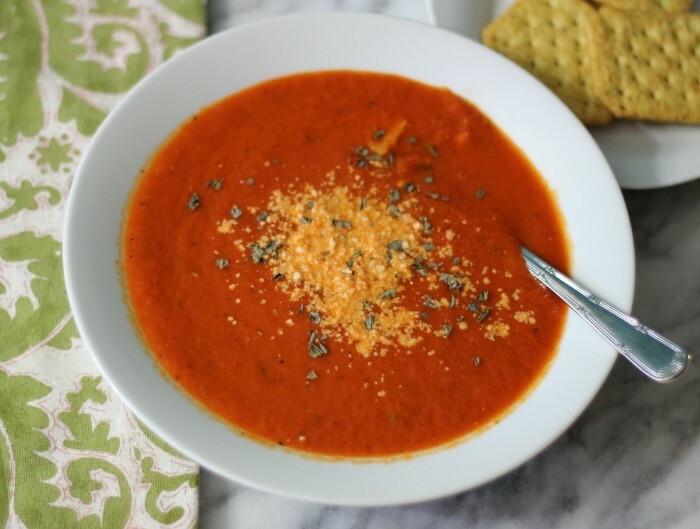 So today I created a simple homemade Roasted Red Pepper Tomato Soup. It is hearty, filling and comforting, all of the things I crave this time of year. 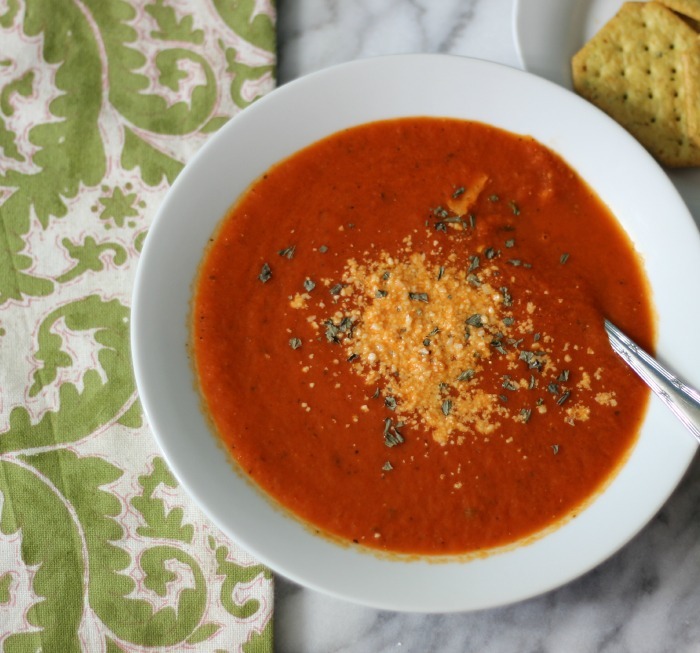 This soup is made with roasted red peppers, plum tomatoes, chicken stock, but you could use vegetable stock too and seasoning to give an extra boost of flavor. Did you know that cooked tomatoes have more antioxidants and better nutritional value than raw tomatoes? Good reason to eat your soup. 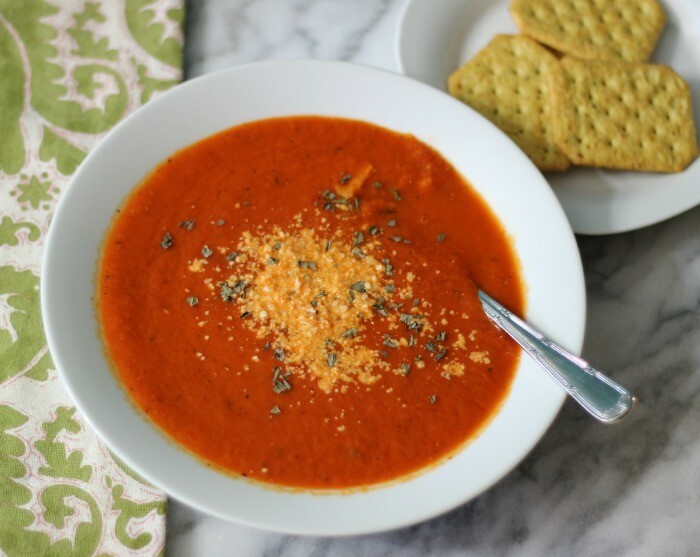 A comforting, simple, creamy homemade soup made with plum tomatoes and roasted pepper. In a stock pot heat olive oil over medium-high heat. Add onions and garlic and saute until tender, about 5 minutes. Add tomatoes, red peppers, chicken broth, salt, pepper, sugar and basil; stir until combined. Bring to a boil, lower heat and simmer for 25 minutes, until the vegetables are tender and the flavors have melded together. Taste for seasoning and add more salt and pepper. Puree using a hand held immersion blender until smooth. Over low heat, add milk and cook until warmed. I hope your staying warm! Have a wonderful day! Looks delicious. What is sprinkled on top? I sprinkled Parmesan cheese and dried basil. Thank you so much! I appreciate it! I hope you try it. As I told you on Facebook, I did make your recipe for supper, last night, with a couple of minor tweaks. It was absolutely delicious! So much so, that my husband even had two big bowls. This recipe is definitely staying in the rotation! I am so glad you liked it! Thank you for telling me. Jen: I haven’t made roasted red pepper soup in years. Yours looks so damn delicious. 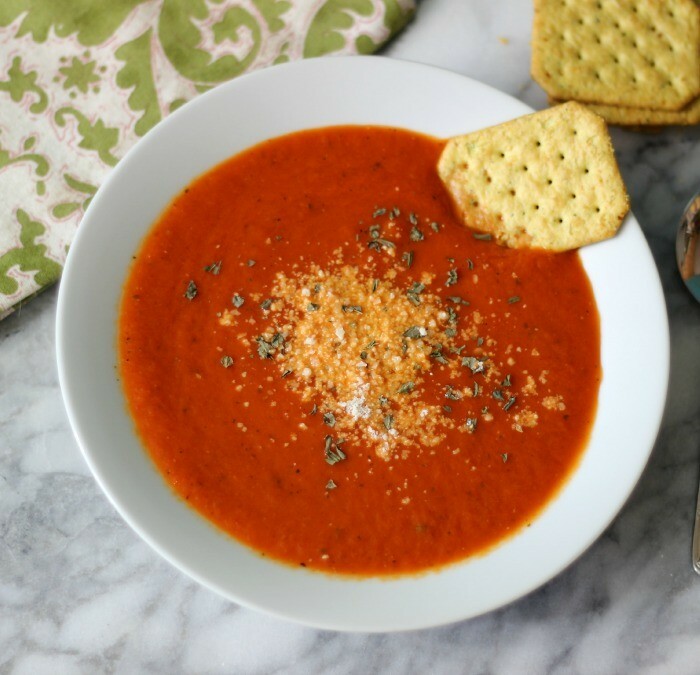 Tomato soup really is the perfect remedy to the winter blues. I love your addition of roasted red peppers, it sounds so flavorful and aromatic! Thank you so much Mary Frances. I kind of have a thing for roasted red peppers. They add a nice different flavor to the soup.